The Sega Saturn (セガサターン), is a video game console manufactured by Sega and was the successor to the Sega Mega Drive/Genesis (as opposed to add-ons such as the Sega 32X and Mega-CD). 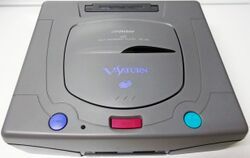 Initially released in 1994, the Saturn was a 32-bit compact disc-based system, and was a key player in what is now widely known as the fifth generation of video game consoles. The Saturn was first released on November 22, 1994 in Japan, May 11, 1995 in North America, and July 8, 1995 in Europe. 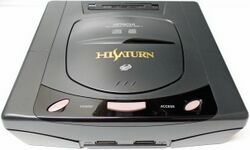 Depending on where you live, the Saturn could be described as either Sega's most successful console of all time (Japan) or one of their biggest commercial failures (North America). 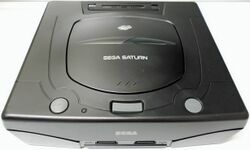 Despite being powerful for its time, its complex hardware and inability to meet rapidly evolving consumer expectations and demands put it in a distant third place in the Western world, but a combination of 2D sprite games, 3D arcade ports and strong marketing campaigns made the Saturn the most successful Sega console in Japan. Estimates for the total number of Saturns sold worldwide range from 9.5 million to 17 million. 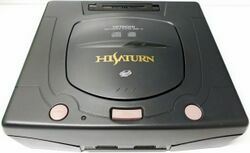 The Saturn's main competitors were Sony's PlayStation released just a week after the Saturn in Japan, and the Nintendo 64 from September 1996. Its arcade counterpart was the Sega Titan Video (ST-V) system. It was succeeded by the Sega Dreamcast in late 1998. The Sega Saturn is the successor to the Mega Drive, though as a video game system it is almost entirely different. It is a "32-bit" console, marketed in such a way that it appeared to be an evolution of the "16-bit" era of video gaming dominated by the Mega Drive and Super NES (which in turn succeeded the "8-bit" Master System and NES, respectively). This description, however, was initially fabricated - Sega of Japan originally claimed the Saturn was a "64-bit" consoleMedia:SegaSaturn94JPCatalog.pdf and some within Sega even chose to call it an "128-bit" machine, a number arrived at by cumulating processors rather than simply picking the main CPU. Alternatively some areas of Sega simply went down the "multi-processor" route, refusing to get drawn into the perceived differences between 32-bit and 64-bit. This was incidentally the last video game generation where these so-called "bit wars" were considered to matter. The system uses CD-ROMs as its primary choice of media. Though it contains a cartridge slot, this is not used for games, but rather backup memory or RAM cartridges. The former was to extend the space for save games beyond that of the Saturn's internal memory, while the latter was used to augment the Saturn's limited memory and to avoid long CD load times. The Saturn has two controller ports, and the standard Saturn controller builds on that seen in the six button Sega Mega Drive controller. It adds two shoulder buttons, first seen on the Super NES controller, bringing the amount of buttons up to nine. The 3D Control Pad, released later with NiGHTS into Dreams, would supply the console with an analogue stick and analogue shoulder buttons, the latter later being used in the Sega Dreamcast before being adopted by Nintendo and Microsoft for their GameCube and Xbox consoles, respectively. The Sega Saturn hardware combined features from several Sega arcade systems. It has a multi-processor system, like arcade machines. Its geometry engine consists of three DSP math processors, two inside both Hitachi SH-2 CPU and one inside the SCU, which were all intended to be programmed in parallel using complex assembly language, similar to how Sega programmed 3D arcade games at the time. The VDP1 combined features from the Sega System 32 and the Sega Model series, with a quad polygon engine based on the Model 1, and texture mapping capability based on the Model 2 and System 32. The VDP1 is capable of drawing more polygons than the Model 1, but less than the Model 2. 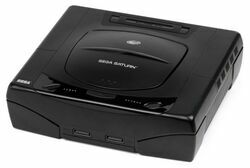 The Saturn was also influenced by the Sega Model 1's use of a separate graphics processor for the 2D backgrounds (based on the Sega System 24). The quad polygons are drawn with edge anti‑aliasing (for smoother edges), forward texture mapping (a form of perspective correction), bilinear approximation (reduces texture warping), and medium polygon accuracy (resulting in seamless polygons). 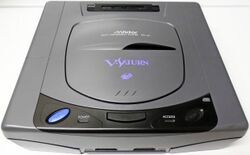 The Saturn's VDP2 was based on Sega System 32 technology (an evolution of Super Scaler technology), used for both 2D backgrounds and 3D planes; the latter can be manipulated as polygon objects. The VDP2's tiled infinite plane engine uses tilemap compression and a form of scanline/tiled rendering to draw large, detailed, 3D texture-mapped infinite planes (for things such as grounds, seas, walls, ceilings, skies, etc. ), with perspective correction and a virtually unlimited draw distance (and capable of effects such as transparency, parallax scrolling, reflective water surfaces, fog/misting, fire, and heat haze), at a very high tile fillrate for its time. The VDP2 draws 3D infinite planes as large as 4096×4096 pixels at 30 FPS, equivalent to a fillrate of over 500 MPixels/s, significantly larger than what any console or PC hardware were capable of with polygons at the time. It requires 1 million texture-mapped polygons/sec, with 500 pixels per polygon, to draw a texture-mapped 4096×4096 infinite plane at 30 FPS; the Dreamcast was the first home system capable of doing this with polygons, as it was the first home system that exceeded 500 MPixels/s polygon fillrate (using tiled rendering). The Saturn was known for its difficult 3D development environment (especially for third-party developers), including its complex parallel processing hardware architecture, requiring familiarity with assembly language, lack of an operating system, and initial lack of C language support, useful development tools and graphics software libraries. Sega eventually provided DTS support for these features in late 1995. However, the C language development tools were not very well optimized for Saturn hardware, only tapping into a fraction of the Saturn's power, compared to assembly language which could tap into most of the Saturn's power. For example, the libraries did not use the SCU DSP, nor were they well-optimized for a multi-core CPU setup. Some of the advanced techniques used by Sega's first-party AM studios did not become available until the introduction of SGL (Saturn Graphics Library). Only a handful of developers were able to squeeze most of the power out of the second SH-2 CPU, and even fewer utilized the SCU DSP, as its assembly code was more complex than the SH-2. Assembly language was often used by Japanese and British developers, but rarely used by American developers who preferred C language. The VDP1 rendered quadrilateral polygons, which, despite being used by the most powerful gaming system at the time (Sega Model 2 arcade system), did not become industry standard for 3D graphics, compared to the more widely used triangle polygons. The VDP2's tiled infinite plane engine, which could draw large 3D infinite planes with a much higher draw distance, texture details and fillrate than polygons at the time, was unfamiliar to most developers who relied on polygons to construct 3D planes. 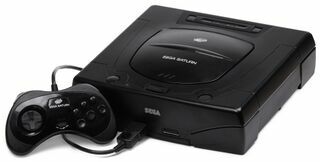 Sega's first-party 3D games often utilized both CPU, the DSP, and/or both VDP, but the hardware's complexity and difficult 3D development environment led to most third-party developers only utilizing a single CPU and the VDP1, just a portion of the Saturn's power, for 3D games. This was also partly due to the advanced techniques used by Sega's first-party studios being unavailable to third-party developers until the introduction of SGL. While the VDP2 was under-utilized for 3D games, it was frequently used for 2D games, where the VDP1 draws sprites and the VDP2 draws scrolling backgrounds. Main article: Sega Saturn consoles. There are a variety of Sega Saturn models of different shapes and colours, as well as novelty units, such as the Game & Car Navi HiSaturn. Differences between systems are not as drastic as seen with the Sega Mega Drive - the same basic feature set and component designs were used throughout the console's lifespan in all regions. First seen on launch day in Japan (1994-11-22), the HST-3200 (later revised and released as the HST-3210, although the differences aside from a BIOS update are not fully understood), commonly referred to as the "grey Saturn" (although during development it had a metallic finish), was the basis for all Sega Saturns released between the Japanese launch and early 1996. 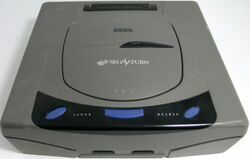 These Saturns use blue "oval" buttons, mounted to black plastic at the front of the unit, and have both "power" and "access" LEDs similar to the Sega Mega-CD. The Saturn saw variants produced by Hitachi and Victor as the HiSaturn and V-Saturn respectively, though aside from altered BIOSes and aesthetics (and bundles/pricing) these do not deviate much from the Sega designs. Novelty value sees these models worth slightly more in pre-owned markets - fewer were produced than the Sega models, but compatibility rates are much the same. Overseas versions are physically identical (save for region encoding), but use black plastic throughout. Released in March 1996, the HST-3220 stands as the only significant change to the Saturn's design, although functionality wise, the only feature omitted is the "access" LED seen in previous models. Reportedly the change in colour scheme was made to appeal to younger and female demographics. 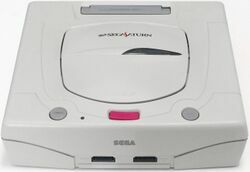 These "white" Saturns likely cost less to produce (they were certainly sold for a lot less in Japan), but from a user perspective the change is largely negligible - the console is roughly the same size and has no problems running any Saturn software. White Saturns opt for grey "circle" power and reset buttons and a pink "open" button for lifting the lid. It is rumoured, though not proven, that the HST-3220 has a faster disc reading time than its earlier counterparts, meaning quicker loading screens in games. When brought overseas the console continued to be shipped only in black, although the North American and European models have different coloured buttons. 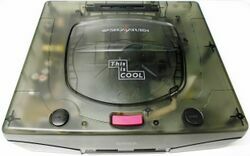 In 1998 Sega started releasing special versions of these consoles with semi-transparent plastic under the "This is cool" brand - only 30,000 units were produced. Again aside from aesthetic differences the consoles are interchangeable. Some of the Japanese colour designs were also brought to Brazil. Main article: Sega Saturn/Hardware revisions. 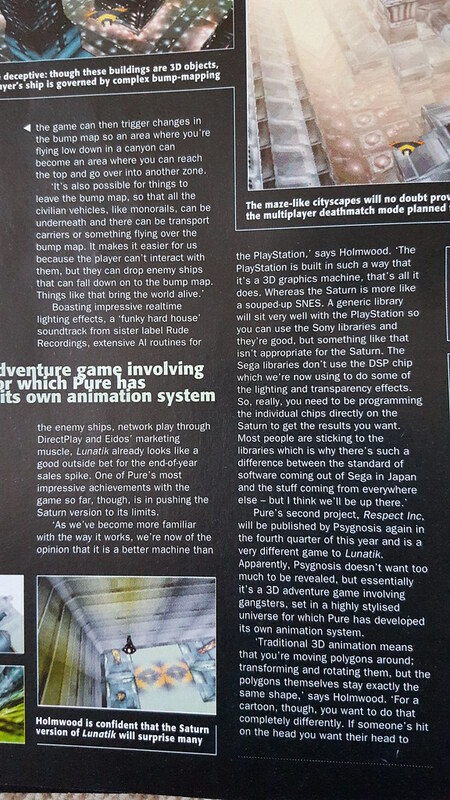 Main article: Sega Saturn/Technical specifications. 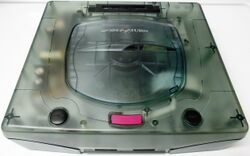 Main article: History of the Sega Saturn. SSF is a highly compatible emulator, which is in continual development by a single developer. GiriGiri was initially based on an abandoned emulator by Sega themselves, and was considered the best until development ceased and SSF overtook it. Yabause is an open-source effort to create a Saturn emulator. Meanwhile Yaba Sanshiro the old uoYabause is a fork of Yabause centered in Mobile version like Android and iOS. Kronos is a fork of Yaba Sanshiro focus in a PC platforms: GNU/Linux and Windows. Mednafen Sega Saturn is also an open-source that is still in an experimental stage, but already highly compatible and can play games that don't work properly with SSF or Yabause. Nova is a new and last emulator join to the party. Which is in development by a single developer. Software that plays files in the Saturn Sound Format, which stores audio ripped from games, does so through emulation of the audio-related code only. Main article: Sega Saturn games. Main article: Sega Saturn/Magazine articles. Main article: Sega Saturn/Promotional material. Dave's Sega Saturn Page - Famous fansite that was extremely popular during the Saturn's heyday (no longer updated).